Provide the most comprehensive ANI/ALI database possible for CAD. GeoNENA® works with an agencies GIS base map of discrete addresses and the NENA 512 formatted file provided by the agency's Telco providers to manage the transactions required to maintain an ANI/ALI database. The use of Geographic Information Systems (GIS) technology as an interoperable component of GeoNENA® application. The functional ability to link records from the NENA 512 formatted file to the base map, making corrections to one or the other database as required. A group of diagnostic tools that identify the records that do not reconcile, isolating problems for the efficient application of operator focus to resolve the problems. The ability to export a corrected file for return to the Telco provider to repair their data so that the errors do not reappear with the next download from the Telco provider. 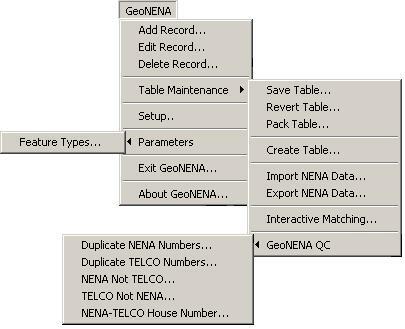 GeoNENA® is used in conjunction with GeoAuthor® or MapEdit© and GeoPoints©. This provides the user with an intuitive set of tools for managing a digital base map and the telephone numbers associated with discrete addresses/locations. As a prerequisite, GIS base maps built with the GeoAuthor® or the MapEdit ToolKit© both of which include GeoPoints© are required in order to access the functionality offered by GeoNENA®. GeoNENA® uses the database of discrete addresses created and maintained in within the MapEdit© project with GeoPoints©. GeoAuthor® is used to manage the point based tables. The point table is used for matching the Telco data, thus linking the Telco data to an X and Y coordinate location.